IfM Review - 3D printing: The shape of things to come? 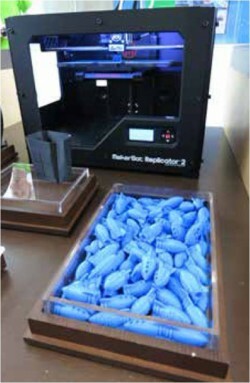 IfM Home > Research > IfM Review > Issue 1 > 3D printing The shape of things to come? 3D printing The shape of things to come? If you ask the proverbial man or woman in the street what they understand by the terms ‘stereolithography’, ‘selective laser sintering’ and ‘fused deposition modelling’, you’re likely to be met with a blank expression. Say the words ‘3D printing’, though, and you’re likely to be met with an entirely different response. Over the last couple of years, 3D printing has attracted significant media attention. Stories about 3D printed Stradivariuses, undetectable plastic guns, novel building designs, personal miniatures, medical devices and a variety of other 3D printing objects, have become an almost daily occurrence in the mainstream press. 3D printing has been heralded as a technology that will transform the world, with commentators claiming that it could be “bigger than [the] internet” (Financial Times) and “the PC all over again” (The Economist). Even Barack Obama has added his voice to the clamour, stating in his 2013 State of the Union Address that 3D printing “has the potential to revolutionise the way we make almost anything”. While 3D printing is now attracting significant attention and generating high expectations, the process of ‘additive layer manufacturing’ (the academic term for 3D printing) can be traced back to technologies that were first developed and commercialised in the 1980s. Two of the leading 3D printing companies, 3D Systems and Stratasys, were founded in that decade based on innovative stereolithography (SLA) and fused deposition modelling (FDM) technologies. Between their founding and the present day, the technologies have been used for many years to help prototype development and create custom tooling moulds. The present excitement stems from the increasingly widespread use of 3D printing for the manufacture of final products. 3D printing has been heralded as a technology that will transform the world, with commentators claiming that it could be “bigger than [the] internet” and “the PC all over again”. Alongside the development of high performance industrial 3D printers such as those developed by 3D Systems and Stratasys, the ‘maker’ movement has spawned a plethora of lower-priced, lower-quality, Alongside the development of high performance industrial 3D printers such as those developed by 3D Systems and Stratasys, the ‘maker’ movement has spawned a plethora of lower-priced, lower-quality, consumer-grade machines based on FDM technology, such as those offered by RepRap, MakerBot, Ultimaker and PrintrBot. The result of these two parallel developments is an industry that is now worth an estimated £1.3 billion. takes 20 minutes to produce. Although the origins of the largest 3D printing companies lie overseas, the UK is home to a number of leading research institutions that are investigating the potential of 3D printing. The potential importance of the technology has been recognised by the UK government and is reflected in the investments it has made into the EPSRC Centre for Innovative Manufacturing in Additive Manufacturing, and the Centre for Additive Layer Manufacturing. Such research is important and necessary. Historically, the UK has been good at such experimental research and development, and novel technologies are expected to emerge from research institutions. However, where the UK has often been less successful is in the commercialisation of technologies from these institutions. It is here that research at the IfM comes in. Led by Dr Tim Minshall of the Centre for Technology Management, Bit by Bit: Capturing the Value from the Digital Fabrication Revolution is a project that seeks to understand how value is being created and captured in the 3D printing industry, and how UK firms will be affected by 3D printing technologies. The project is jointly funded by the Engineering and Physical Sciences Research Council (EPSRC) and the Economic and Social Research Council (ESRC) under the ‘New Economic Models in the Digital Economy’ theme. The need for cross-disciplinary approaches is reflected in the make-up of the investigating team, with Professor Ian Hutchings from the IfM’s Inkjet Research Centre, Dr Chander Velu, Lecturer in Economics of Industrial Systems at the IfM and Dr Finbarr Livesey, from the University’s Department of Politics and International Relations, bringing their knowledge of digital fabrication science, business models, and economic policy respectively to bear on the project. Under their leadership, the research team of Dr Letizia Mortara and Dr Simon Ford are currently engaged in the first part of the project: investigating the industrial emergence of the 3D printing industry. Such an investigation is necessary at the beginning of the project as it is only through an understanding of historical patterns and processes that we can hope to gain insights into how current events are unfolding and how they will shape the future. This historical study involves analysis of supply and demand in the industry; supply in the form of equipment manufacturers, and demand in terms of the early users of 3D applications such as prototyping, in the aerospace and automotive sectors, and in the development of hearing aids and orthodontics. Later in the project the researchers will explore the different business models companies are using to capture value from 3D printing, and how 3D printing enables new business models to be adopted in the digital economy. During the course of the project, the team also hopes to welcome a number of visiting researchers to the IfM. 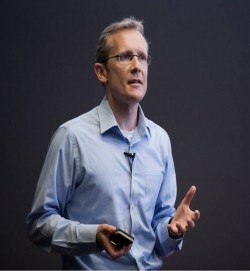 The first of these was Dr Christian Sandstrom from Chalmers University whose study into the adoption of 3D printing in the hearing aid industry was provocative in that it indicated that while 3D printing had provided some efficiency and cost benefits to hearing aid manufacturers, its adoption had caused very little impact on the competitive position of the companies operating in the industry. So, while 3D printing is certainly big news, there is still a long way to go. As with all disruptive technologies, uncertainties abound. ‘Bit by Bit’ will help both industry and government better understand and benefit from the undoubted opportunities to create and capture value that 3D printing will provide. You can find updates on this project and digital fabrication trends on Twitter and on the project blog. You can also join the growing community of interest around this topic by signing up to the Bit by Bit 3D Printing Interest Group on LinkedIn. We are all used to inkjet technology for printing at home or in the office and, in recent years, it has had increasing impact in commercial printing. However, it can also be used to deposit materials other than ink as individual droplets at a microscopic scale. This allows metals, ceramics, polymers and biological materials (including living cells, as seen on page 4) to be patterned on to substrates under precise digital control. This approach offers huge potential advantages for manufacturing, since inkjet methods can be used to generate structures and functions which cannot be attained in other ways. 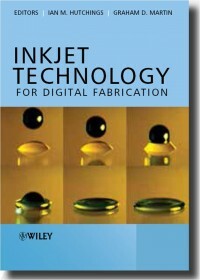 Inkjet Technology for Digital Fabrication, edited by Professor Ian Hutchings and Dr Graham Martin from the Inkjet Research Centre, with contributions from both academic researchers and leading names in the industry, provides a comprehensive overview of the use of inkjet printing for digital fabrication along with practical information on industrial applications.